COLUMBIA- When Laurie Matthews hired Joe Bias in June to replace some siding on her home, it was in good faith. She had hired him before. "I was getting estimates on roofing for a rental property, and so I chose him and he did it, did a nice job," Matthews said. "He did take a while to get that roofed, but he did a very good job on it." It's now October. Matthews is out $4,150 with a giant hole in her wall, and Bias is in jail for delivery of a controlled substance, with a bail of $75,000. Bias and his wife Aimee are the owners of Valley View Roofing, a construction company based out of Columbia specializing in roofing, siding and gutter needs. Matthews said Bias was the first to point out that she had a bulge in her backyard wall siding, and he offered to fix it for her. "He said, 'Do you care if I look behind to see if there's any damage?' And I said 'no,' not realizing what a huge portion of my house he was gonna take off," Matthews said. According to bank records, Matthews paid Bias the $4,150. Matthews said he cleared the wall on July 29, letting Matthews know he would have the siding in by August 11. But come that day, Bias was nowhere to be found. 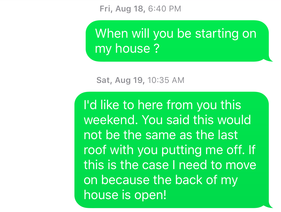 Several back and forth text messages continued to escalate the situation, and by August 23, Bias had still not installed the siding. Matthews gave him several chances to respond and threatened to take action if he didn't. "Prosecuting attorney, small claims, Target 8. I went on Yelp, I went on different sites to give him bad reviews," Matthews said. The texts started getting stranger after that. 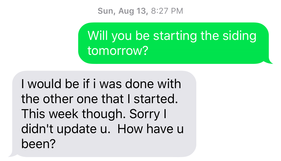 Whoever started texting Matthews after August 23 referred to Bias in the third person as if it wasn't his phone number. "It must've been his wife," Matthews said. 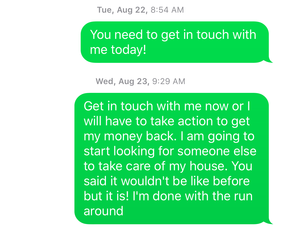 Matthews texted Bias stating she would have to hire someone else to finish the job if she didn't hear back from him. The unidentified texter responded claiming Matthews had fired Bias, which is why the siding hadn't been installed yet. "I didn't fire you. I just need my house taken care of," Matthews said. They said they would allow Matthews to speak with Bias come Monday, September 4, because he was out of town for an emergency. September 5 rolled around, and still, Matthews received no response. "Then I just quit contact. I don't want to play the game of lies," Matthews said. Matthews hasn't heard from Bias since Sept. 5. "Basically, he never came back out," Matthews said. And there's a good reason why he didn't. 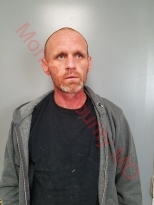 The Hannibal Courier-Post reported that on Sept. 29, Bias was arrested in Monroe County as part of a drug bust that could bring a drug supply ring within five counties to a halt. Photo courtesy of Forrest Gossett with the Salt River Journal and Hannibal Courier-Post. Bias was arrested along with four others. When officers arrived, Bias tried to flee but was quickly tackled and cuffed. Bias is now in the Randolph County jail with a bond of $75,000, awaiting a preliminary court hearing. 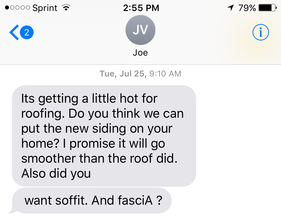 Matthews isn't the only one who's had issues with Valley View Roofing. Joe Bias has a history of complaints and lawsuits for uncompleted work. 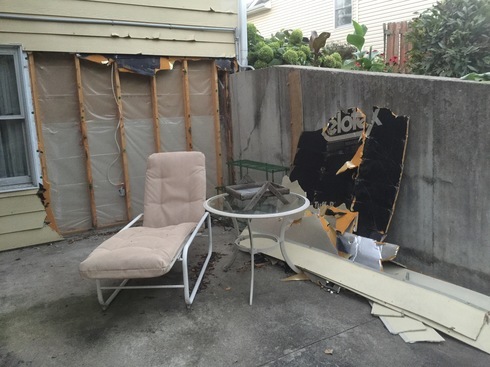 One customer said he was left with a ruined roof and $20,000 less in his bank account after working with Bias. "We purchased a new home back in July of , and when the inspection was done, the inspector noted there were some issues with the roof," said Craig Franklin, a professor with MU's Department of Veterinary Pathology. "The inspector recommended Joe as a roofer. Our first mistake was to not really look into his background." Franklin was out of the house when Bias began working on the roof, but he raced back after getting a frantic phone call from Bias that the roof had collapsed. 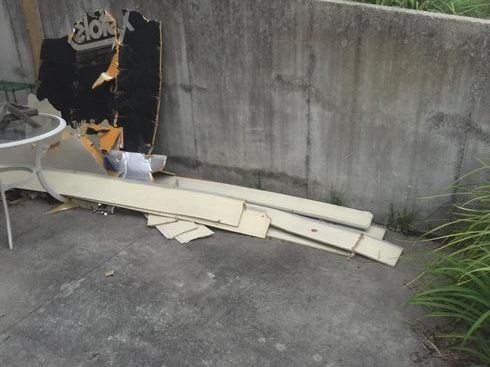 "He had been taking off some of the paneling, and that destabilized the roof and he fell through our family room ceiling," Franklin said. Now with more damages and infrastructure to replace, Bias gave Franklin a new estimate of $50,000 to complete all the repairs. Franklin then paid Bias $22,500. "I have some friends from way back in high school that are construction folks, and they said, 'woah that seems like way too much,'" Franklin said. Franklin and his wife did some research and found several complaints against his business, as well as a history of drug-related arrests. "We asked Joe to discontinue work," Franklin said. He then decided to take legal action. "We tried to get our money back. I don't think that will ever happen, but we really did it more for the purpose of insuring that no one else would run in to something like this," Franklin said. "We had a decision in our favor, but you know, it's not gonna go anywhere." According to court records, in November 2015, ABC Supply also filed a lawsuit against Valley View Roofing for failing to pay for more than $7,000 in supplies. The company won the case in December 2016, but it's unclear if ABC received damages from Bias. ABC Supply declined to comment on the lawsuit. "Even though I'd used him twice, if I would've done it originally... I would've known he had other complaints with the Better Business Bureau," Matthews said. 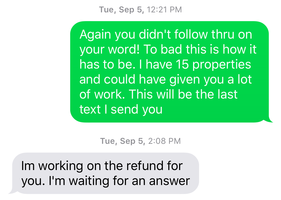 Valley View Roofing is currently unaccredited by the Better Business Bureau and has an F rating on its website with five customer complaints, all telling similar stories: they partially paid Bias for a job, and instead of finishing, he vanished with their money. "One of the most important things to do is to not give people money when they haven't done the work. So generally what we recommend is at most you would give a third of the money when the job gets started," said Sean Spence, regional director of the Better Business Bureau. "If you're gonna hire someone, do some research," Matthews said. Bias was not at his office when we visited, for now obvious reasons. Even though his business card listed 720 Grace Lane Suite C as his office address, an employee of James Fencing fence company, the business with which he shared office space, said Bias hadn't rented that space since 2016. When we called the number on his business card, it went straight to voicemail. An earlier version of the story reported that Bias was in the Monroe County Jail. 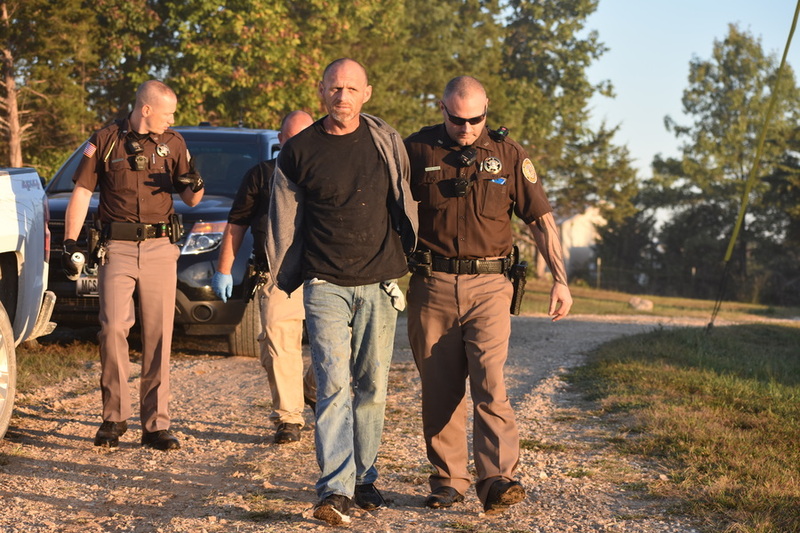 We have corrected it to say Randolph County Jail.